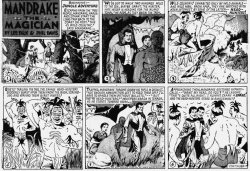 "Jungle Adventure" is the 44th Mandrake Sunday story. The story was written by Lee Falk and drawn by Phil Davis. Escaping from the tree people our friends start the long trip back to the coast on foot. After a tough trip where they encounter wild animals, headhunters and cannibals they meet the mysterious professor Metro. Next they take the short way to the sea, Peril Road. Having survived six peril they face the final peril, Lori in the country Lethe. Who has enslaved all the citizens of the country, using a secret memory-destroying powder. The title for this story is taken from the strip of August 14, 1949 (Beginning: Jungle Adventure -).